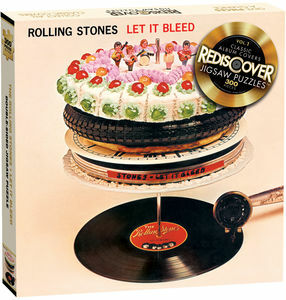 This double sided, 300-piece album cover puzzle features the artwork of both the front and back cover from The Rolling Stones album, Let It Bleed. Collect all classic covers puzzles and give PIECES a chance. The Stones ended the Sixties with this spellbinding rock ‘n’ roll album full of violence, fear and frustrated desire. It was their last record with founding member Brian Jones, who died midway through its recording, and their first with new guitarist Mick Taylor. Keith Richards commissioned the cover art from his friend Robert Brownjohn, who had also designed the title sequences for the James Bond movies From Russia With Love and Goldfinger. The cake on top of the stack was decorated by then-unknown Delia Smith. She later became a famous TV chef, and the UK’s best selling cookbook author.